(Nanowerk News) What if a diabetic never had to prick a finger to monitor his or her blood-glucose levels, and instead could rely on an internal, nanoscale device to analyze blood continuously and transmit readings to a hand-held scanner? Kyungsuk Yum, University of Texas at Arlington That's the life-transforming medical technology that Kyungsuk Yum, an assistant professor in the Materials Science and Engineering Department at The University of Texas at Arlington, is developing with support from a $100,000 Texas Medical Research Collaborative grant. Yum's innovation depends on an injectable, near-infrared optical biosensor nanotube that would read a person's blood glucose constantly and an optical glucose scanner that can access the data collected by nanotube. "Continuous blood glucose monitoring is essential in every diabetic's life," Yum said. "This device could unlock continuous information vital to a diabetic's quality of life." The American Diabetes Association estimates that more than 29 million people live with diabetes in the United States. That's nearly 10 percent of the population. According to the World Health Organization, about 371 million worldwide have the disease. 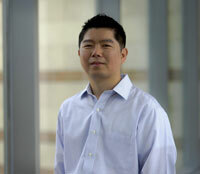 Yum became interested in this research because he wanted to help people with diabetes. "It is a huge societal problem," Yum said. "I believe this nanotube sensing technology has that potential and could potentially provide a better way to manage diabetes and improve the quality of life for people with diabetes." Early research on single-walled carbon nanotube-based optical biosensing technology was published in high-profile journals like Nature Nanotechnology, Journal of the American Chemical Society, Angewandte Chemie and ACS Nano. Most recently, a review paper on this topic was published in the March 2015 of Biotechnology Journal. Yum joined UTA in 2013 following postdoctoral research appointments at the University of California, Berkeley, and the Massachusetts Institute of Technology. He is also a faculty affiliate of The University of Texas at Dallas and UT Southwestern Medical Center in Dallas. The Yum Research Group at UTA focuses on integrating man-made and nature's micro- and nano-scale materials, processes and systems for engineering innovation. The lab works on research projects at the intersection of physical sciences and engineering, and life sciences and biomedicine at that micro- and nano-scale. He applied for a 2015 Texas Medical Research Collaborative grant to further some aspect of the work and collaborated with A. Dean Sherry, University of Texas at Dallas chemistry professor and director of the Advanced Imaging Research Center at UT Southwestern Medical Center. The Texas Medical Research Collaborative is a research partnership among universities, health care providers and corporations supporting health care. Current diabetes technology offers patients two options. One requires that a tube be inserted through the abdomen for use of a continuous glucose monitoring system. The more common method requires a finger prick that provides blood for an external system called a glucometer. The drawback to the sensor system is that it reads glucose levels in the patient's tissue, which is not as accurate as blood readings. Plus, the continuous glucose-monitoring sensor needs to be calibrated multiple times a day and changed out every five to seven days. The drawback to the glucometer is that it requires painful finger pricks throughout the day. Khosrow Behbehani, dean of the UTA College of Engineering, said Yum's work is representative of biomedical innovation that will improve health and the human condition, which is aligned with one of the core themes of UTA's Strategic Plan 2020: Bold Solutions | Global Impact. "It's compelling work that could improve the way diabetics live every day," Behbehani said. "When research touches lives in such a way, it can dramatically affect the health care of millions of people."